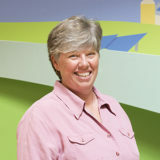 With over 25 years of accounting and finance experience working with Vermont’s green, socially responsible companies, such as Ben & Jerry’s, Seventh Generation, and Keurig Green Mountain, Inc. Lauri brings a wealth of knowledge and understanding of shared values to SunCommon. A native Vermonter, Lauri grew up in Springfield, VT. She earned a degree in Business from Keene State College and after moving to South Burlington in 1999, pursued further education through Champlain College and CCV, earning another degree in Accounting. Lauri shares her life with her partner of 31 years, Marcy, and their 13 year old daughter Madison. When not working, she enjoys sporting events, especially those involving Madison’s soccer league, camping with friends along the shores of Lake Champlain, biking, hiking, reading, and traveling. She is an avid handy-woman, who has built several houses for her family, doing the plumbing, electrical, roofing, and siding with her own hands!